First you need to get rid of the old upholstery. I have no pictures of that, sadly, but that’s a different story with each chair anyway. Start by turning the piece around and see how the fabric is attached. The most usual options are either staples or tacks, which are short nails with a wide head. There’s tack pullers and wood staple removers in the stores, but I’ve just used a dull knife to get under the staple or tack and lift it up a bit, and then removed it with pliers. Make sure to remove the fabric without ripping it (opening the seams is fine), because it’s easiest to use that as a template for the new fabric. I’ve removed all of the padding, although if that’s in good shape, it’s fine to just change the cover fabric with perhaps a new layer of batting to plump it up a bit. Here’s my chair with the new foam padding in place. Most vendors will cut the pieces for you, so I traced the shape of the cushions to a paper and took those to the store. I attached with super glue. I find that spray glue doesn’t work as well as the regular stuff, but YMMV. Top off with batting (I used polyester) and cut it to shape. Pull the corner so the top forms a nice curve and attach it under the chair. Mold the flaps how you want them to lay (you can play with the angle and placement of the folds) and attach them. Check to see that the front lays nice and flat and attach that, or if not, change the corners one at a time to pull in the excess from the front. Then do the same on the sides. You may have to remove the first staple next to the handle, so that you can get the fabric to lie nice and flat on the side, too. You can fold the fabric next to the handle more or less and pull it less or more to get it to lay how you want. Again, you’re attaching the fabric next to the handle, so that you know how much of the fabric you have to work with, in the back of the seat. 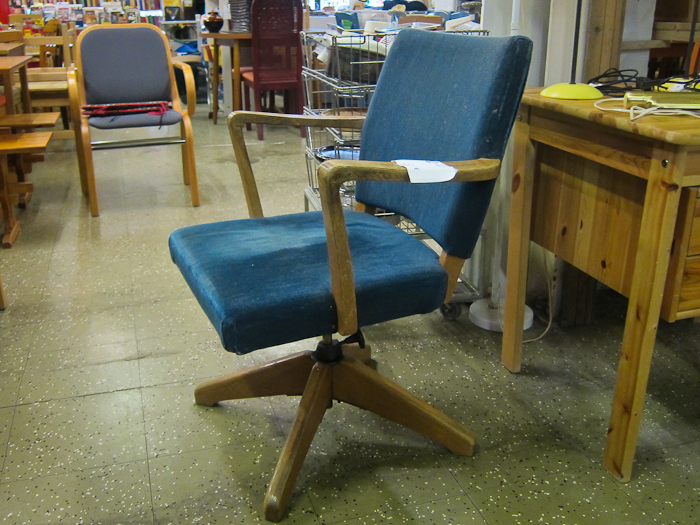 Pull the fabric taut to the back of the seat up against the backrest. 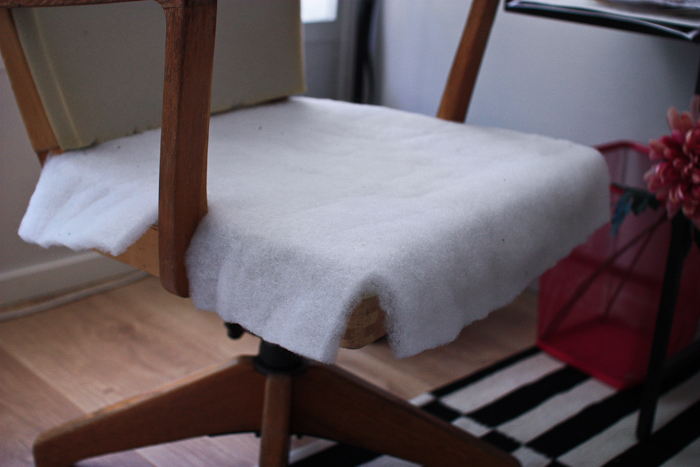 Cut a line on the folded extra fabric towards the middle of the backrest beam and then make it into a small “Y”. Check if it’s enough (by placing the fabric like it should lay) or if you have to deepen some of the cuts. Fold and tighten the fabric around the wood so it lays flat. Attach everything. Go over the bottom to make sure you’ve attached all the sides and corners suficiently and nothing is out of place. Here the technique is similar as in the seat. You’ll start just the same, next to the handle, and go all around, attaching the sides and the bottom of the back rest front fabric with staples (or tacks) to the back of the backrest. They will be covered by the back fabric later on. Fold the cover fabric under the batting (sandwich the batting in the folded edge). Make sure to pull the top of the side taut and attach that to the back. Fold the cover flap over the back rest and temporarily pin with sewing pins. 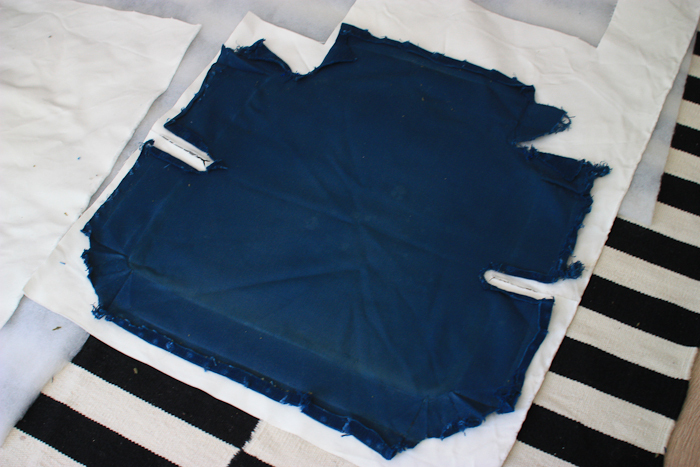 After folding and pinning both sides flat, pull in the middle to make the fabric taut over the middle of the back rest. 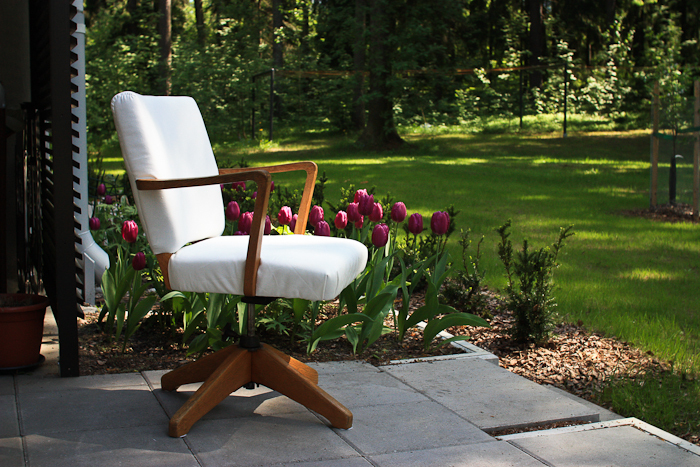 This will bring out the curve of the backrest – before you had a straight fabric in front of the backrest and a space between the fabric and batting. Staple in the middle so that you maintain the tautness and the curve. At first I thought to use either a green or grey fabric, but the green fabric is a bit thin and the grey seemed dull when I’d looked at it for a while. I had some durable white canvas left over from the sofa project and figured I’ll just use that for now. I think I’ll sew a slipcover from the green – that way it’s easier to replace if it’s too thin to handle the use. 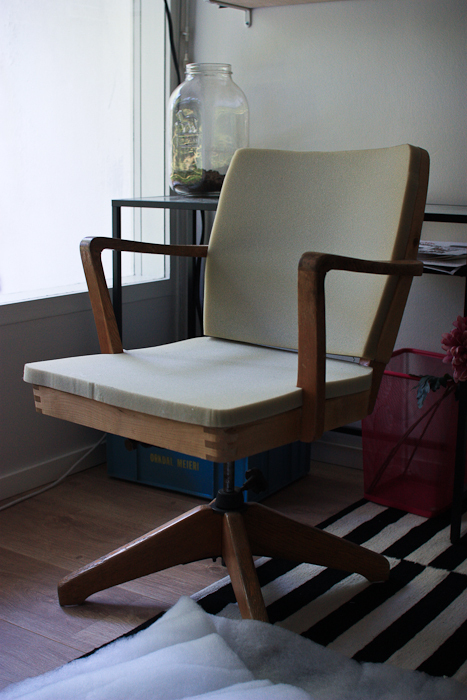 Here’s a tutorial on how I upholstered this chair! 🙂 Hope you like it!